DC Motor interpole polarity diagram and explanation-aka The Mother-Daughter Rule for DC motors and generators. Interpoles in armature circuit. Polarity of field poles and interpoles. Interpole polarity and field polarity. 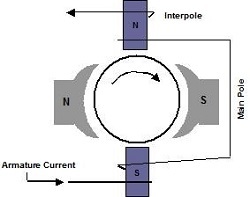 DC motor field and interpole polarity. DC Motor Interpole Polarity with respect to Field Polarity. The "Mother-Daughter Rule" for Interpole Polarity. this rule may have been broken.